Living History At Lincoln's Summer Retreat A country home on the outskirts of Washington, D.C., provided a respite and a summer getaway for a president mired in the Civil War. 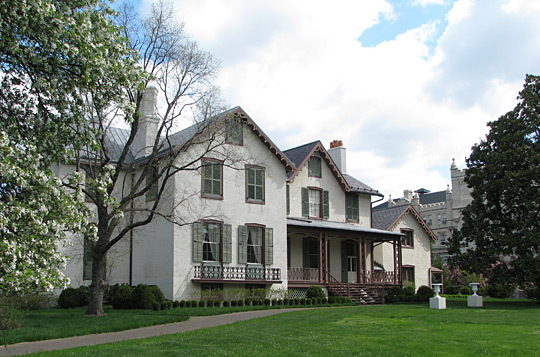 President Lincoln and his family stayed here on the grounds of the Soldiers' Home during the summer months of 1862-1864 to escape hot and chaotic downtown Washington. On his daily horseback rides from the cottage to the White House and back, Lincoln would make frequent stops to greet Cabinet members, the war wounded and others. 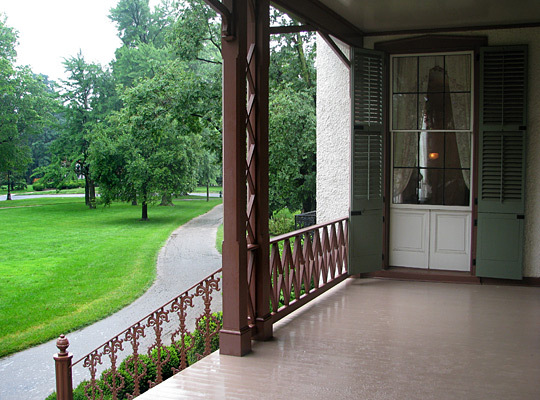 The view from the cottage porch — similar today to what Lincoln saw — was an escape for the war-beleaguered president. The rambling "cottage" has 34 rooms, including a library. Even with air conditioning, Washington, D.C., is a hot and humid place in the summer, and when Abraham Lincoln was president, the summers were even worse: On top of the heat and humidity, there was the Civil War. So for his three summers in office, starting in 1862, Lincoln moved out of the White House to a not-too-distant cottage on a hill just off Georgia Avenue, one of the capital's main thoroughfares. Tucked away from the road on the grounds of the Soldiers' Home, the cottage sits on one of the highest points of the city and offers a nice breeze, tall trees and swaths of sloping green lawns. Lincoln spent about one-quarter of his presidency there. Restored by the National Trust for Historic Preservation and opened to the public for the first time in 2008, the cottage allows visitors to learn about a place that was news even to Lincoln historians. Frank Milligan, the director of the Lincoln Cottage, says much of the information about the former president comes from soldiers who guarded Lincoln when he was in residence there. "We learn a lot from these guys because they were bored and educated," Milligan explains. "So ... they wrote letters, they wrote diaries home." The soldiers describe Lincoln's walks around the grounds, as well as his tendency to pop his head into their tents in the evening to see his soldier "boys." He also sat on the veranda, rocking and taking in the view of the incomplete Capitol dome to the south. Milligan calls the porch "Lincoln's escape" — but it wasn't a total escape. Ambulances would pass by carrying the war's wounded, and the first national veterans' cemetery was on the cottage grounds. Still, Lincoln could enjoy the hillside breezes while he jotted notes for the Emancipation Proclamation or thought through major policies. And it was a refuge from the White House routine — which, Milligan says, Lincoln didn't like. "[The White House] was hot. It was loud. It was stinky," Milligan says. "His son had died from the bad water down there. It was a swamp." Moreover, Milligan says, the noise of war at the White House was "an ever-present reminder to this man that, as the war progressed, [Lincoln] alone was becoming more and more responsible for its continuation." The term "cottage" is something of a misnomer for Lincoln's retreat; it's actually a 34-room country home built by George Riggs, a young Washington banker, in 1842. Riggs eventually sold the house to the federal government, which needed a retirement home for veterans, and though earlier presidents stayed at the cottage, no president loved the place as Lincoln did. And so, in the summer, Lincoln was a commuter, riding on horseback 4 miles a day down to his White House office. 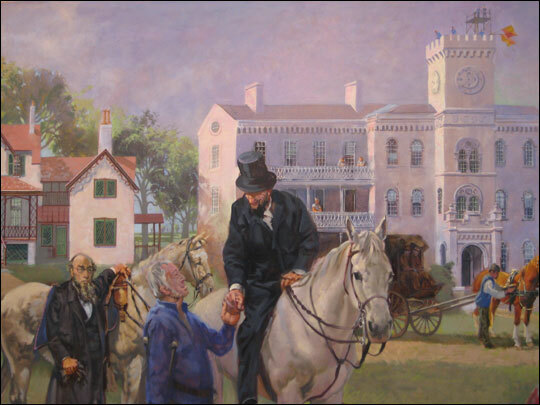 Many mornings, David Derickson, the captain of Lincoln's cavalry guard, had to pry the president out of the cottage library to get him to go to work. "Typically, [Derickson] said, he would find [Lincoln] here reading Shakespeare or the Bible or military strategy," Milligan says. "And Derickson would get him up and into the front room for his coffee and egg, and on his way down to the White House." Today, the drive down Georgia Avenue takes maybe 15 minutes, but in the 1860s, on horseback, it was slower and dicier. "A good portion of that route was wilderness, and the outskirts of the city was kind of a rough lot," Milligan says. Along the way, Lincoln might call on Cabinet members who lived nearby. He passed hospitals — Walt Whitman, working as a nurse, spotted Lincoln almost every day — and stopped to visit the wounded, winding his way to work. Lincoln's long workdays made for some interesting stories. A Kentuckian's diary entry for July 20, 1862, notes being invited to the Lincoln Cottage for the evening but finding no president present. Disappointed, the diarist and his friends started to ride back to town. En route, they had an unexpected encounter. "They see this lone horseman galloping toward them, and they describe his coat flapping in the breeze and the top hat on his head," Milligan says. "It's Lincoln, riding alone, galloping back [to the cottage] on a Sunday evening." Lincoln's habit of riding alone dismayed his secretary of war, Edwin Stanton, as well as the Union Army's top general. "For the first summer, he had no military protection," Milligan says. "And finally Stanton and, ironically, George McLellan, whom [Lincoln] fired twice, and, to her credit, Mary Lincoln, all were coming to the same conclusion: 'This is nuts.' "
By the fall of 1862, Lincoln's military guard and cavalry guard had been assigned to protect him on his commute. Meanwhile, the Civil War got closer. Artillery fire from various nearby battles was heard on the hill. By 1864, Confederates had attacked the capital, and Lincoln's guard was called to the front to defend the city. Mary Lincoln, mad with fear, begged for help. "Think of it," Milligan says. "The first family of the United States protected by 125 soldiers, and there are 17,000 Confederates a mile away, and you're here in the middle of the bush." The family was rushed from the cottage to the White House under cover of darkness. But Lincoln was back the next day to witness the war. Milligan says all of that history swirls in the winds that wrap the Lincoln Cottage. In his four years living on these grounds as director, he has encountered no ghosts, he says, but he certainly feels the presence of a force. "All you have to do as a visitor is come out here and sit on that veranda, and feel that breeze, and absorb some of the story and understand the huge weight, the crisis upon crisis that this man ... carried, virtually on his shoulders, for four years. ... He was, as [Lincoln historian] David Donald said, alone and lonely." 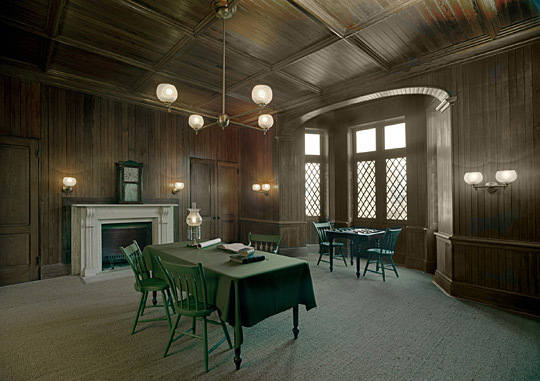 That loneliness — as well as the solace of the place — is still palpable at Lincoln's Cottage. Born 200 years ago, Abraham Lincoln spent the last summer of his life — those brief 56 years — on these gentle green slopes above the tumult of the federal city.